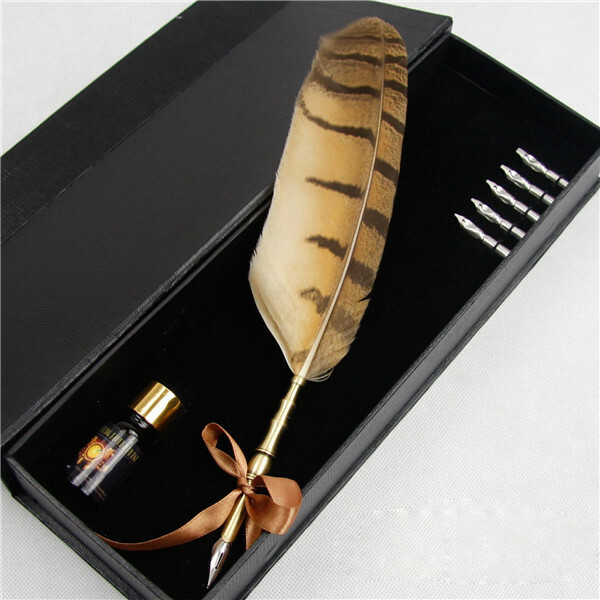 Genuine Nature Quill Pen, , organically dyed and hand assembled with a detailed Brass handle. Pen is approximately 8" in length and is fitted with a removable nib for an easy and graceful flow. Paired in a gift presentation box with our Apothecary Writing Ink(we cannot ship the item to some countries with ink ,due to the regulation of shipment by air, pls understand it) . A wonderful gift for writers of all ages.there are three different stainless steel nib in one set. This item is shipped in a gift-box, 14" long and 4" wide. Please choose your Feather Pen Color in Options Box.